The ideal quick reference for the busy mental health clinician seeing younger patients, the Fifth Edition of Green’s Child and Adolescent Clinical Psychopathology has been fully revised by a new team of authors active in clinical practice and resident education. A trusted reference in the field, Green’s continues to provide practical and balanced information on the full range of medications used to treat mental health disorders in children and adolescents. · Detailed coverage of medication usage—including both FDA-approved and evidence-based off-label uses. · Precautions and warnings help readers avoid prescribing errors and adverse drug interactions. · Emphasis on recent and highly used medications, with older and less often used agents grouped in an Appendix. · Convenient, reader-friendly organization makes essential information easy to find and use. 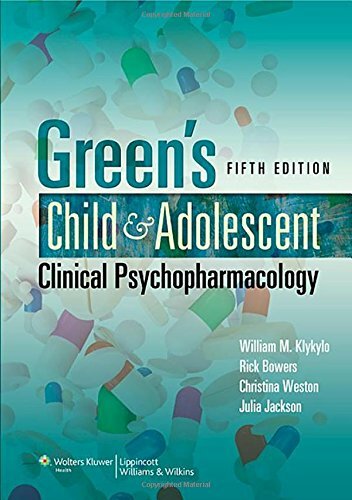 The ideal quick reference for the busy mental health clinician seeing younger patients, the Fifth Edition of Green's Child and Adolescent Clinical Psychopathology has been fully revised by a new team of authors active in clinical practice and resident education. A trusted reference in the field, Green's continues to provide practical and balanced information on the full range of medications used to treat mental health disorders in children and adolescents. This rapid reference delivers: detailed coverage of medication usage - including both FDA - approved and evidence-based off-label uses; precautions and warnings help readers avoid prescribing errors and adverse drug interactions; emphasis on recent and highly used medications, with older and less often used agents grouped in an Appendix; and convenient, reader-friendly organization makes essential information easy to find and use. New to the Fifth Edition: increased focus on medication effects and cost-effectiveness; new information on cardiac function and risk factors in patients taking stimulants; long-term suicide risks associated with SSRIs; longer term outcomes of major depression treatment; use of anticonvulsant medications in patients with bipolar disorder; and weight gain in patients taking antipsychotics.